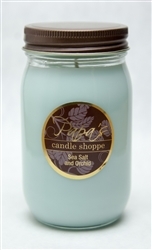 This 16 oz Mason jar candle blends salty highlights with soft floral scents to create a clean and awesome aroma. I love this smell! It will go in my bathroom. The color is so vivid and bright!